The government has made clear its intention to excise poor care in the NHS. After the scandal at Mid Staffs and the Keogh Mortality Review into high death rates at 14 other NHS trusts come reports that survival rates at England's hospitals are dramatically worse than those in other Western countries. According to a Channel 4 News exclusive, patients at England's hospitals are 45% more likely to die compared to those in the US. The figure originates with Professor Sir Brian Jarman, an eminent statistician who developed the Hospital Standard Mortality Rate (HSMR), which is used to determine whether the number of deaths at a hospital is higher or lower than expected. Comparing hospital mortality rates in seven different countries, Sir Brian concluded that England's hospitals were far worse than the international average. 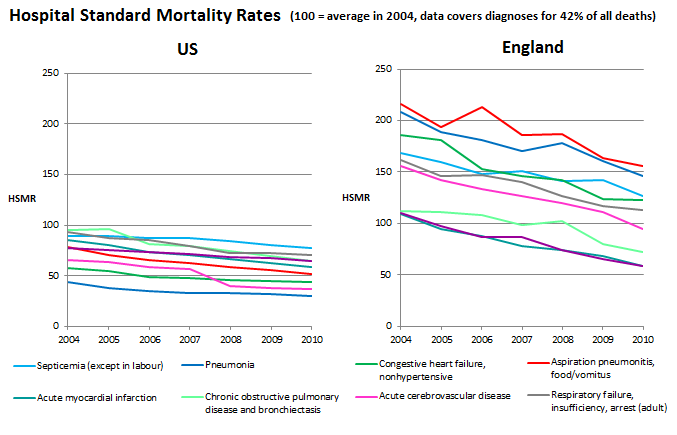 His data shows that in 2004 England had the highest mortality rate of the seven countries analysed. Since then, however, our mortality rates have improved faster than any of the other countries surveyed. According to Channel 4, "The data is so sensitive that the only other country we can name is America, which comes out the best." This is not an ideal arrangement, but Sir Brian has kindly provided us with the data that he did share with the broadcaster. From this, we can see that the NHS compares particularly badly with hospitals in the US. Sir Brian used Hospital Episode Statistics for England and compared the data with a 20% sample (stratified and random) of US hospitals. Overall, if we look at the average mortality rates for 2010, an NHS patient with one of the diseases listed was (on average) 45% more likely to die than if they'd been treated in a US hospital. The average HSMR in England was 105; the US equivalent was 55. Sir Brian is clear that "there are many caveats about these data". He emphasises - as he has done on other occasions where it's been used - that the Hospital Standardised Mortality Rate (HSMR) is "no more than a trigger" to investigate further. The seven countries in question do not use the same health information systems. While there are similarities in how hospitals collect data on their patients, there are also differences in - for instance - the way illnesses are 'coded'. It might be that not every country records deaths from respiratory arrest under a single, transferrable code; instead, there might be an overlap between fatality categories. "The US system is very different from the UK and the US spends more than twice as much per person on healthcare as the UK and still has lower life expectancy and higher infant mortality rates." While Sir Brian's research has not yet been peer accredited in an academic journal, the medical director of the NHS told Channel 4 News that he will be reviewing the data seriously. The Times quotes Katherine Murphy, chief executive of the Patients Association, as saying: "We can't ignore data like this that gives us a clear message that there are deficiencies within the system."